We just released another update to ManageWP with several new features. You asked for it and we listened, the Google Analytics integration is now a part of ManageWP. The option is available under Settings, and once you change it to Google Analytics just press Connect. After authentication for Google, ManageWP will automatically match sites from your Google Analytics to the sites you have added to ManageWP. You can also change this manually under Options for each site. 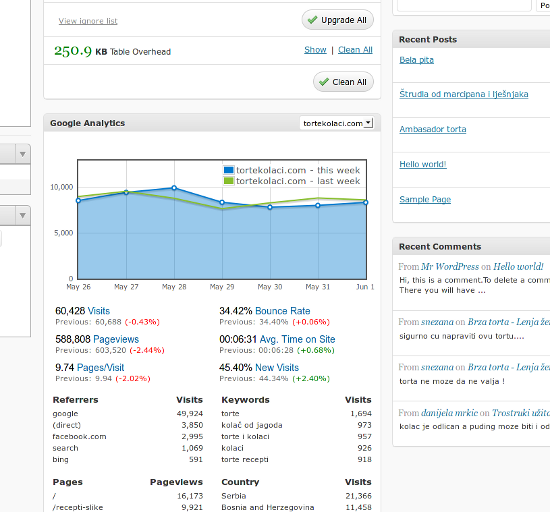 The end result is a new widget in your dashboard, showing the Google Analytics overview for each site. Second novelty and a feature many users requested is the ability to ignore certain updates in the automatic updates mode. Now you can specify which plugin, theme and even WordPress core updates you want to ignore and they will not appear any more in the dashboard. This allows you to hit the Update all button without thinking that a plugin that you tweaked will be overwritten by a newer version. To manage ignored items, look under the Settings screen for ‘Ignore updates’ option. Some of our users have mutiple websites managed on the same server. This is most typically the case with users using shared hosting. In the past when you load the dashboard, ManageWP would request information from each of your sites simultaneously to achieve maximum possible loading speed. The same approach was used for updating WordPress or plugins. However one some servers with lot of websites, some of them would time out or not load (appearing in red in the dashboard). Or sometimes plugin and WordPress updates would fail as several blogs on the same server started the updates in parallel. We have included an option where you can select the maximum number of requests that can happen in parallel on the same IP. If you are having problem while loading dashboard try decreasing the number of requests down until you get satisfactory results. the same goes for ‘Write’ type of requests like plugin and WordPress updates. Dashboard loading times are up to 50% faster now for users managing lots of blogs. Use the new “Show favicon“option in the Settings screen to show favicons for your websites in the list. 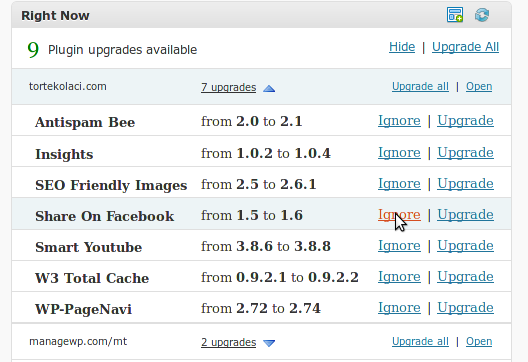 More intuitive management of favorite plugins and themes, makes installing them much easier. Look under Install Plugins/Themes. Full backups now also include WordPress installation folders and any other folders present in your site. Full is really full now. Scheduled posts are now also available on the dashboard, together with Published and Drafts. Schedules backups of websites to Amazon S3 and Dropbox services. Add users to your ManageWP account with limited access. As always your comments and feedback are most welcome. And if you have an idea worth sharing, drop it at our idea forum for others to vote. We will incorporate the most requested features in the following updates to the service. I don’t use GA for most of my sites, I use Clicky and/or WordPress instead. I have noticed that ManageWP stats are much higher than WordPress stats for example. What kind of number do you count for these stats? We count +1 whenever a page footer is displayed. It is very simple stat. To clarify, the GA feature only adds stats to the dashboard but it doesn’t insert the tracking script. Correct? After reading this I’m sold, regardless of how much this thing is going to cost.